They are Light weight and will go with any outfit. 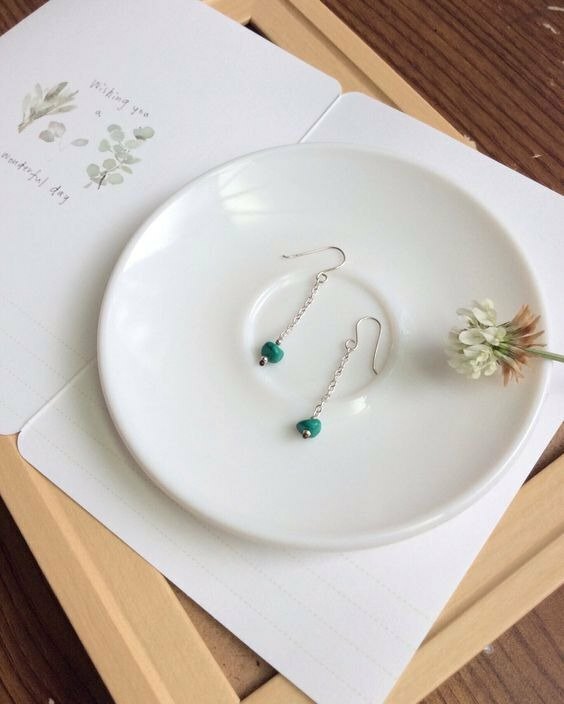 /Product story/If You Love Turquoise you will love these Earrings. simply beautiful... Your earrings will arrive beautifully gift wrapped. /Material /Turquoise x 925 silver /Specification/ The length of the earrings is about 3 cm. /Manufacture time/ This is a "pre-order" item, and will be shipped after 3 days . /Notice / Please remember that even though I do my best to be accurate in my photos all monitors display photos differently. /Clean / If silver jewelry becomes slightly yellow in color, you can clean it with a solution made of baking soda and water. Soak the silver in the solution. Then, gently clean the tarnish off with a soft toothbrush or sponge. Finally rinse the silver with clean water and wipe dry. /About Ops / OPS = original x passion x spirit. Wish our design will become wonderful part of your life, inspire you to enjoy every moment .